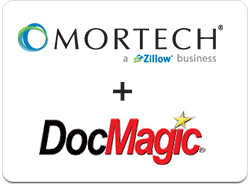 TORRANCE, Calif.— DocMagic, Inc., the leading provider of fully-compliant loan document preparation, compliance and eDelivery solutions for the mortgage industry, today announced that Mortech®, a Zillow® business, has integrated DocMagic technology into its Marksman® software. This integration will allow users to run regulatory compliance checks, generate upfront disclosures and re-disclosures (Change in Circumstance documents) and deliver them for customers to sign electronically via DocMagic’s eSign technology. Designed for mortgage bankers who want instant information, Mortech’s Marksman software provides accurate, real-time, best-execution pricing data. As the only pricing engine with a partnership with AllRegs®, Marksman provides unmatched compliance and is in use by hundreds of lenders, including correspondent lenders, credit unions and community banks. DocMagic’s technology will now allow joint customers to create upfront disclosures, initiating a deeper relationship with their prospective borrower.